Head on over to The Shelving Store and receive free shipping on kid's and mini lockers. Hurry, this doesn't last long. Click link to view. Save up to 50% at The Shelving Store's clearance sale. Click link to shop. 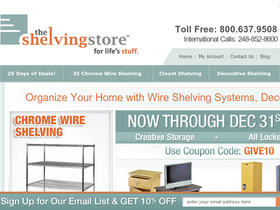 For a limited time save 30% on all Chrome Wire Shelving at The Shelving Store. Click link to view.